Published November 8, 2018 Filed under US News. Total of no comments in the discussion. 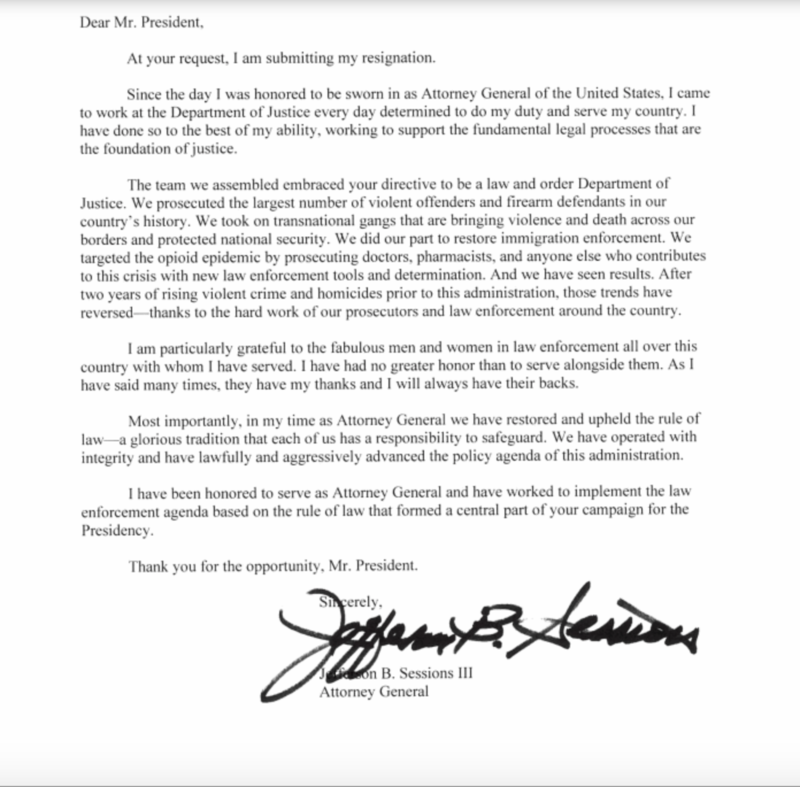 Former Attorney General Jeff Sessions defended his rocky tenure atop the U.S. Department of Justice in his resignation letter to President Donald Trump Wednesday, writing that he and his aides effectively implemented the administration’s law and order agenda. Trump announced Sessions’s firing by tweet Wednesday afternoon, heaving one final insult on a cabinet underlying he had come to loathe. As attorney general, Sessions assembled task forces to pursue and destroy MS-13 and steadfastly defended the administration against federal trial judges who enjoined Trump initiatives like the travel ban and rescission of the Deferred Action for Childhood Arrivals (DACA) program. But their ideological sympathies were unable to bridge the chasm opened by Sessions’s decision to recuse himself from special counsel Robert Mueller’s investigation of Russian interference in the 2016 presidential election, which has left the president and his family exposed to potential legal liability. Longtime Trump loyalists like Michael Cohen have become ensnared in the probe, now hanging over an embattled White House. The president’s displeasure was so extreme that he reportedly discussed terminating Sessions with the AG’s own staff. Sessions aide Matthew Whitaker will serve as the acting attorney general pending confirmation of a successor.